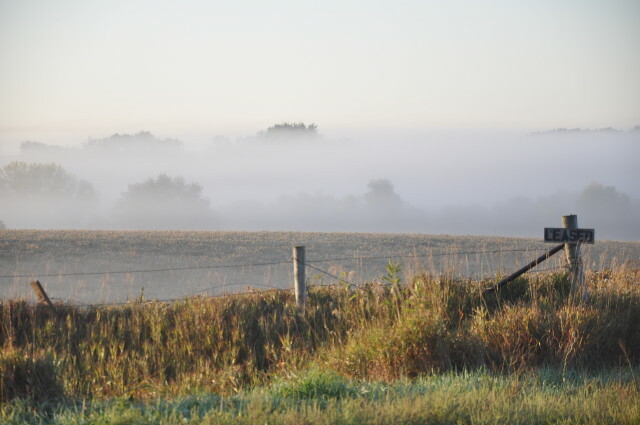 I had both hands on the steering wheel, while I drove through the fine, gray mist hanging in the air. If you could have looked straight into my heart, it would have looked something like that soupy, sad sky. I was filling my brain with all kinds of bla-aaah and negative self-talk. I sank deeper in the car seat, like I had a big, fat “L” on my forehead. I caught my breath, surprised by joy. Surprised by God. I replied, out loud. “I do. I do know!” I sat up a bit taller. The guy at the stoplight might have thought I was crazy, going on and on like that, talking into the air. But, hey, it worked. Because pretty soon, the enemy wasn’t saying a word anymore. Sometimes, I forget how much God loves me. God loves you, and He likes you. Maybe you needed to hear that, because it’s true. You were God’s idea. You were not an accident, or a mistake or a coincidence. You, my friend, are a God-incidence. A beautiful, one-of-a-kind, made-for-this-moment-in-history God-incidence. And you are utterly cherished. Today, you might not feel loved. You might be replaying old tapes, and you might figure that since it’s almost Halloween, you’ve got the perfect excuse to wear a mask and convince the whole world that everything’s fine, just fine. But God sees you. He sees behind the mask, to the beautiful person He created. And right now, I’m pretty sure He wants me to tell you this: He loves you for you. And you’re the favorite you He ever created, because there’s no one else on Earth quite like exquisite, never-before-created you. I needed to read this tonight. I needed to be reminded that God loves me even when I don’t like myself, let alone love myself. That His opinion of me never changes! How wonderful! Hi Cheryl … I am glad the words spoke to you. Thanks for coming by this week. Bless you, my friend, for sharing this. I so needed to hear this today. Currently I am so immersed in stress and negativity that is seems that’s all that comes out of my mouth – all the bad things in my life tend to lead, it’s how I introduced myself to a new group I joined recently. I needed the reminder that God does love me for me – just the way I am. When I focus on that, my entire outlook is so much brighter. I’m printing this out to read and reread. Blessings! 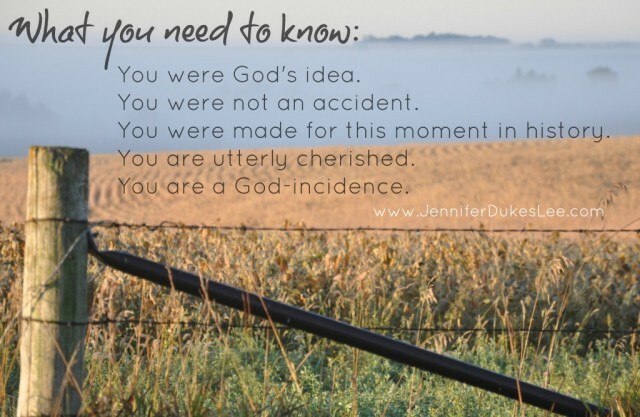 Praying that God gives you abundant reminders today that you are the only YOU He created. You have your own unique shine, for His glory. Jennifer, this just further drove home what I have been dwelling on for the last few days. And I wrote about it in my post today. I love when God brings His message across to me again & again, in different ways, so that I get it – we must take our thoughts captive. Bless you, friend! He is so good! Glad the message reiterated what He was already speaking to you, beautiful friend. What a wonderful reminder! I need to put an index card on my dashboard whith that question! Thanks so much for the encouragement! Jennifer, It’s funny how negative thoughts can hit us while driving. Not humorous, but interesting. And what a wonderful reminder that even in, maybe especially in, our pits of negativity He reaches down and speaks reminders of a Father’s love. Thank you for speaking beautiful truth over us. Blessings to you! Oh, this message. I am loved. Thank you, Jennifer. It’s a reminder I always need to hear. You’ve blessed me today. Cross sighting! Leased? No! Purchased! With blood. I KNEW you’d see that. I just KNEW it! 🙂 … It’s right across the road from our driveway. His truth washing over you, washing away the Enemy’s schemes. It’s those ordinary, everyday moments that really make our faith. Will we sink deeper in the lies? Or will we tune our heart’s to God’s voice and answer back with boldness and thanksgiving, “Yes! Yes, I know how much I you love me!” You are so loved, Jennifer. And so am I. Thank you. You are so welcome, dear Becky. Thank you for being here. God incidence. I love that. Need the reminder often for this leaky heart & mind. Thank you for your encouragement Jennifer. Love you, friend and am always, always blessed by hanging out here! “He loves you for you. And you’re the favorite you He ever created, because there’s no one else on Earth quite like exquisite, never-before-created you.” Amen! Who doesn’t need to be reminded of this? I love you, too, Karrilee. Thanks for stopping by. Your encouragement is always a light to my soul! Praying for your “stuff,” Michelle. I don’t know the details, but I know the One who does. Oh, how different our world would if all of us truly understood the depths of His love for us! Thanks so much for the reminder and the link-up. My pleasure, Heather. I so enjoy reading the stories you all bring to the linkup. I really needed to be reminded of this today. Feeling downhearted and down-on-myself, I had just been praying for a lifeline. His love for me personally is a lifeline! Thank you, Jesus! I am so happy to hear that the words encouraged you this week, Trudy. God bless. Can’t tell you how happy I am to see a quote from you next to a quote from the Apostle Paul. That’s too awesome. One day last month, a friend sent me two verses, written out, via mail. I have kind of a litany I pray every day that I change up with the church seasons. I felt led to put in the Joshua 1:9 along with: “Keep Calm. Push Back. You are amazing. Love, God.” Totally freaked me out, but maybe less so because of “Love Idol.” I’ve been praying it every day. Not sure what it all means yet. Praying that prayer with you, Megan. You really are amazing. I love when God’s truth speaks louder than the enemy’s lies! Your words have greatly encouraged me tonight. I am feeling a bit low, and it’s so very good to be reminded again of how very much God loves me! Thank you for this most uplifting post. Sharon, It brings me joy to know that these words buoyed your soul today. Oh, Jennifer! I thought of Love Idol yesterday when I heard the tragic news of our dear friend taking his own life. How troubled he was – always struggling to allow himself to be approved – to be loved. He loved – deeply. He loved God and his many friends and his love for nature was a gift from God. He was a naturalist of amazing skill and insight – see God in every breath of creation. But, how he wrestled in a hidden room in his heart. No matter how often we told him – we couldn’t reach that deep place with light. If he read your words here – might he have been awakened to TRULY believe? I’m posting a eulogy to him – repost of an old post with links to his blog. Will be processing this for a while. THANK YOU for continuing to blow the trumpet of God’s love! Oh Kathy. … My heart is breaking, as I read this. I am so sorry. So very sorry. Please know that you are in my prayers. Holding you close today. Thank you, Jennifer. Wrestling with wonder – might the Lord have redeemed this in the last breath? Bless you!! That is beautiful.. God-incidence. So many times we need to hear that in our day and many more we need to say it to ourselves and those He has put right in our paths. Thanks for always sharing beauty here, Jennifer! Jennifer such sweet reminders. I am pretty good at negative talk so I needed this reminder of who I really am. Loved it. Great for a Sunday morning.